If your child is going to be absent, you must let the office know before 9am on every day that your child is absent. You can do this by coming to the office or leaving a message on the absence line: 01273 708004. Please tell the office even if you have mentioned it to your class teacher or a member of staff in the playground, otherwise you will be phoned by the School Office. Be aware that any absence you have not told the school about will be unauthorised. 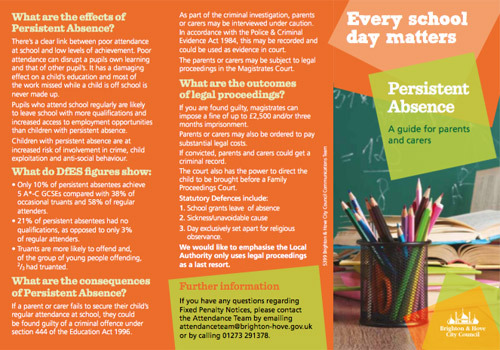 Also, we are unable to authorise a child’s absence for a parent’s illness or appointment. The absence will be authorised if your child is unwell or if your child has a medical appointment. If your child gets better during the day, you are welcome to bring them in to school at this point. If your child has vomited or has had diarrhoea, you should keep them off school for 48 hours afterwards. Please try and make doctor and dentist appointments for after school where possible. A whole day will not be authorised for a medical appointment, unless this has been agreed due to a specific reason. Can I take my child out of school during term time? Unfortunately not. However, a limited amount of time may be granted if the circumstances are exceptional. This is decided by the head teacher. Please write a letter or email to Mrs Willard to explain why you need to apply for leave in term time and bring it to the School Office or email to admin@elmgrove.brighton-hove.sch.uk. 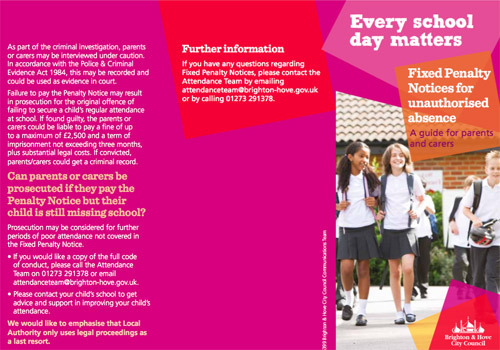 Please be aware that anyone taking unauthorised term-time absence will be liable for a fixed penalty notice of £60-£120. If you have any further queries, or would like to talk to someone about your child’s attendance, please see Lorraine Williams or Sonia Ringrose in the office Monday-Friday, or Lucy Roberts, INCO. Please see below the guidance sent to all schools from the local authority. Excellent attendance! These young people will almost certainly get the best grades they can leading to better prospects for the future. Pupils will also get into a habit of attending school which will help in the future. These pupils are likely to achieve good grades and form a habit of attending school regularly. Pupils who take a two-week holiday every year can only achieve 95% attendance. These pupils are missing a month of school per year. The Government classifies pupils in this group as “Persistent Absentees” and it will be almost impossible to keep up with work. Parents of young people in this group may face legal action being taken by the Local Authority. Parents will be contacted by the school attendance team if their child’s attendance is at 90% or below. If the attendance does not improve, you will be invited to an ASM (Attendance Support Meeting) to discuss any issues preventing your child from being in school and how we can support you with that. An attendance target will then be set and reviewed. If the target is not met, a fixed penalty notice will be issued by the local authority. 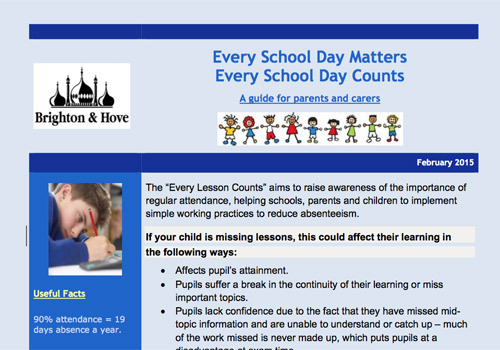 Please click here to find out more information about on FPNs, persistent absence and every school day matters. Please note that if your child has a medical issue, we will work with the school nurse to manage this in school. Please do tell us about it at the first opportunity.